Teaching private violin lessons is my full-time career, and it's a job I look forward to each day. I've developed several volumes of teaching material, over 6 hours of Youtube Videos, and I continue to do extensive pedagogical research on a daily basis. I enjoy the interaction and dialogue at private lessons, and there's nothing more motivating for me than watching a student self-initialize and take responsibility for their own incredible progress. In my studio, students of all ability levels can begin a journey towards mastery and find many successes along the way. Some of my most intense students are only 8-12 years old. These students need special attention and support. I've organized chamber music groups for these students, as well as additional performance opportunities. More common in San Antonio, are late-starting students, who want to do well in youth orchestra seating tests (HCYO, Coker, Yosa), in school orchestra, in UIL solo and ensemble, or TMEA Region/Allstate Orchestras. My late-starting students also do very well, as long as they've set aside about an hour of practice time per day. Predictably scheduled, calm practicing, on a well-rested brain, is the key to success. My student, Victoria Klaunig, performed as soloist with the San Antonio Symphony on Feb 28th, 2016, and is currently pursuing a violin performance degree at UNT. She's also performed with the Moscow Ballet. Other students have participated in the TMEA All-state Orchestra, obtained "1's" at UIL Solo and Ensemble, won full-scholarships to the Cactus Pear Young Artists Festival, placed in the "Sounds like KPAC" competition, attended prestigious summer programs like Lyrica Fest, and have led all of the YOSA orchestras as section leaders. A small handful of students have gone on to pursue music degrees at UT Austin's Butler School of Music, UNT, UTSA, and UIW. Music Education, Music Therapy, Music Performance, Composition. What do we do in lessons? In private lessons, students begin a journey towards violin mastery, according to their own commitment and aspirations. In addition to working on pieces that feature the violin as a solo instrument (Concertos, Short pieces, Sonatas, etc. ), much of the work will also include scales, etudes, and exercises. The overall lesson experience for students is generally an upbeat, honest, positive experience. That being said, the students that have the most fun and see the most progress in lessons, are the students that come 100% prepared with their lesson assignments each week. Real progress means real work. When possible, I like to allow some freedom in repertoire selection. Students will occasionally, play pieces from the Violin Music by Women anthology and the Suzuki Repertoire. However, the majority of pieces my students play are considered to be part of the "Standard Repertoire." The Standard Repertoire, loosely defined, are the greatest hits of the last 300 years of violin pedagogy. I've put together over 40 videos of pieces that I like to teach, as well as my own set of graded repertoire, and students are part of the selection process when choosing a new work. When students have an important seating test, or additional performance of some kind, I'm happy to take some time in lessons to ensure preparedness and confidence. Please contact me for information regarding private lessons, pricing, and policies. With most incoming students, I like to set up one paid initial lesson before starting a course of lessons. I'm open to scheduling phone calls or lesson observations. I'd love to hear about your child's violin experience and help chart a course for future success. I'm also happy to make recommendations for other stringed instrument teachers, or violin teachers that may be the best match for you or your child. I maintain a list of the most highly qualified teachers throughout the city. It's important to find the absolute best match for you and your child. My daughters have been studying with Matthew Zerweck for nearly four years now. He has helped them tremendously learn to finesse their violin skills, and I have seen such great improvement over the years. He is kind and personable, yet pushes and challenges them to become more than they expect of themselves. He teaches in creative ways, catered to each student - how to break down a new piece, to master a solo performance, necessary theory, various technical skills, etc, cramming a lot of teaching into each lesson. He also provides performance opportunities and encourages the valuable experience of working with an accompanist. Matthew really is an amazing teacher and we are so blessed to be studying with one of the very best violinists in San Antonio! Matthew is a brilliant violinist, and gifted teacher. I highly recommend him! I have 2 daughters who began violin lessons at the age of 4 in Maryland. Since then, we have moved around the country as a military family and have had the opportunity to work with many professional violinists, and I can say that Matthew is without a doubt one of the absolute finest. My daughters were ages 9 and 11 at the time we came to Matthew, and I confess both were a little burned out. My youngest wanted to quit. Matthew has an incredible ability to connect with his students, and soon I saw a renewed energy in my girls; in their practice, and in their commitment. I credit Matthew with breathing new life into their studies. Today, my daughters are 12 and 14, and they truly cherish, and look forward to their lessons with him every week...and they have no intention of quitting! I have seen a tremendous amount of growth in my girls' performance and skill level since they began studying with Matthew. I am in awe of his ability to bring musical and emotional expression out of his students. Neither of my daughters intends to be a music major in college, but Matthew encourages and inspires them to reach for excellence nonetheless. Under his tutelage my girls sit first and second chair in their school orchestra, and in their YOSA orchestras, and both have made the Region Philharmonic Orchestra each year they have competed. 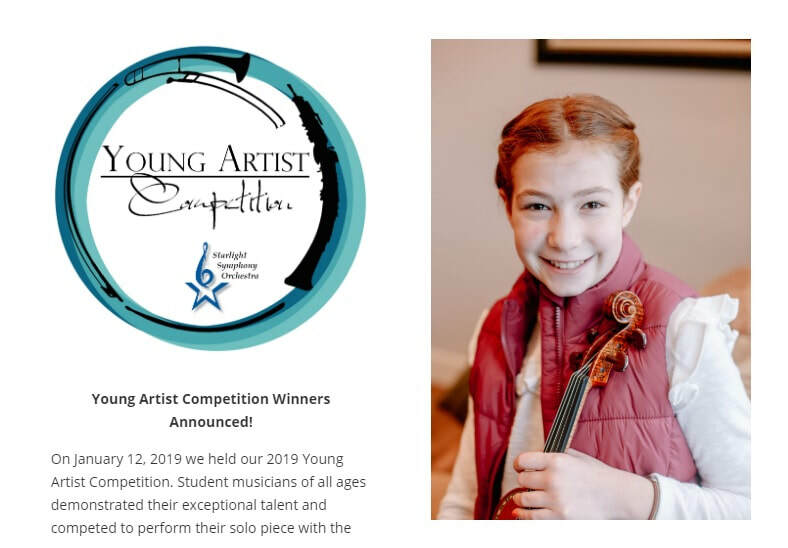 I credit Matthew with their young musical accomplishments, but even more importantly with helping them develop a love and appreciation of classical music and all things violin. In their words, "Mr. Matt is the best teacher ever!" Matthew Zerweck is an exceptional violin teacher. He is able to push his students to accomplish new levels of dexterity by providing new hurdles (concertos and caprices) to vault. He also teaches unique exercises and concepts that other teachers do not. When under his tutelage, I know that I am always improving. I highly recommend Matt as a teacher. Although I have been playing since childhood, and my profession is teaching violin, in the past 8 months of study, Matt helped me discover and modify some aspects of my physical stance that have been sources of tension and pain for years. Matt's kindness, calm demeanor, and sense of humor during lessons calms my anxiety of lesson performance. He has encouraged me to explore my own interpretations of repertoire, providing examples of different applications of the techniques that we have worked on and how they can change the character of the music. I have felt a new freedom and flexibility in my playing, and, without fail, I leave my lesson with a sense of empowerment and enthusiasm about my own progress and abilities. Matt provides an excellent value for his lesson prices. Outside of the regular lesson setting, he also organizes master classes and performance opportunities for his students on a regular basis. Matt exemplifies what it is to be an artist teacher. Working with Matt was a true gift and joy. I came to Matt as an advanced but tired violinist who began taking lessons at the age of 6. I realized after several years that I was not interested in pursing violin as a career, but I did want to continue honing my gift and rediscover the joy of playing. Matt was the perfect fresh start. ​Although I would not be a professional musician, Matt understood and encouraged my desire for music to be a part of my life at an excellent level. Matt constantly created, found, and presented me with new methods, tricks, and tools to help me reach a new level of excellence with each passing lesson. He always provided a balance of challenge, encouragement, accountability, grace, and fun, as I sought to grow my skills and enjoy my instrument. I also had the opportunity to watch Matt teach younger children on several occasions before my lessons, and was always awed by the ingenuity, patience, and friendliness with which he handled these budding artists. I often came to my lessons burned out, frenzied, and guilty for my lack of progress or time to practice, and Matt consistently left me feeling inspired, encouraged, and equipped to pursue excellence. Matt helped me recapture the joy of music and I will be forever grateful. studied with matt for about 3 years and saw the most phenomenal improvement in my skills and performance. he will challenge you with new techniques and music, he will make practicing fun and will load you up with tons of material. very down to earth guy at the same time, you'll definitely feel comfortable being yourself around him. Matthew Zerweck is from our observation one of the bests (if not THE best) violinist in San Antonio. (Just come to the concerts of Camerata San Antonio and listen for yourself.) Our daughter Victoria has had lessons with Mr. Zerweck for the past 3 years. Starting to study with him was a real turning point in her violin career. She has made enormous progress and is enjoying her lessons a lot. Mr. Zerweck challenges her, but is still gentle and motivating in his approach. Many times when he explains techniques and possible improvements to our daughter, she picks it up immediately. It is fun to sit in on such lessons and watch the process. He has an amazing gift as a teacher and we feel that Victoria is getting a excellent preparation for future conservatory studies, which she is planning to pursue. We also enjoy that Mr. Zerweck is confident enough in his own abilities to encourage and initiate cooperation with other violinists, whom he invites for master classes or joint recitals. That gets Victoria exposure to other styles and opinions without getting her off track. This summer, she was accepted to a wonderful quartet program in Massachusetts ("Lyricafest") and a College Audition Preparation program at NYU. In my opinion, this is a testament to Mr. Zerweck and his teaching and motivational skills. If there is anything that I would do different in Victoria's violin education knowing what I know now, it is this: I would have had her start with Mr. Zerweck right from the beginning instead of starting her out with a high school teacher for her violin lessons. She would be even further along now. Seeing how much difference a good teacher can make in motivating a student, I think starting with a teacher like Mr. Zerweck right from the beginning is a good investment. I wish we would have met him earlier and have had the insight that we have now. I was given the pleasure of studying with Matt Zerweck for 2 years while I was attending high school and preparing for my college audition. I heard about Matt through a friend at YOSA, when Matt was still new to the San Antonio area, and her enthusiasm about him was something that really drew me to study with Matt. Studying with Matt was the best decision that I made before I left to study violin performance in college. Matt is the type of teacher that is knowledgable, and well versed in the art of violin and is arguably one of the best teachers one could find in San Antonio. In the two years that I was able to study with Matt, I made tremendous progress, and was even accepted as a performance major, which I would have not ben able to achieve if it hadn't been for studying under Matt. While studying with Matt, he would strive to make sure that improvement would be made, and if there wasn't he would go to the route of the problem so that way progress could be made. He teaching methods inspired those to practice and the will to want to master their piece, or what they were learning. While still maintaining a professional relationship between student and teacher, Matt went above what most teachers overlook and got to know his students on a personal level that way he could truly know how to interact with said student, ultimately helping that student progress and fine their true passion within the art of violin. Overall he is an astounding teacher, violinist, and friend who I am eternally grateful for having studied with him and owe him much thanks for how far I have come in studying violin.